George Gissing is a really good writer. I’m reading his The Odd Women, right now, and it’s a really brilliant feminist novel: probably one of the best feminist novels I’ve ever seen from a 19th century author–it has strong women and weak women, moral women and immoral women, understanding lovers and wrathful lovers. In general, it avoids falling into several traps. The first is the implication that although these women are exceptional, most women are simpletons. And the second is the implication that women, overall, are purer and more moral than men. No, this novel is really fascinating. It deals with a pair of reformers who are trying to teach unmarried women how to earn a living as clerks, but it also has a bunch of other characters. For instance, there’s Monica Madden, who dislikes the reformers and is sooo not about working for a living, and decides to marry a well-off guy in order to escape the working world, only to discover that she needs to assert herself (and profess a belief in the equality of the sexes) purely in order to get her controlling husband off her back. And there are her spinster sisters, Virginia and Alice Madden, who come off as somewhat simple and beaten down by life. They have an indomitable will to survive, but they have nothing more: no energy and no passion. And it’s not their fault! That’s the thing. Gissing recognizes that although their fate wasn’t predetermined (another character, Rhoda Nunn, who faced similar circumstances, managed to triumph and build a life), it was, nonetheless, a product of the oppressive society in which they grew up. I love Gissing. This is the third novel of his that I’ve read in as many months (the others were New Grub Street and The Whirlpool) and all have been exciting and refreshing. However, I do understand why he’s not as popular or well-known as, say, Charlotte Bronte. I feel like Gissing is an author who you love if you’ve read a lot of 19th century British novels. You love him if you’ve become accustomed to the Romantic outlook and larger-than-life characterization of Victorian literature. 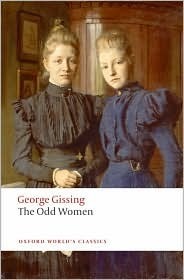 When you open Gissing, everything–the language and the milieau and the plotlines–leads you to expect hijinks and drama. But instead you get solid psychological realism. It’s pretty shocking stuff! Teachers are always trying to point to older novels and say, “Look how ahead of its time this is!” But, really, that’s not what we want in an older novel. What we want from older literature is to see and feel and hear something different–something that’s not being done anymore. We want omniscient, intrusive narrators and long-winded digressions. We want horrific melodrama and strange Dickensian caricatures. And we want those things, because they change our view of what a novel is and what it can do. Art, unlike science, contains no progress. 19th century novels aren’t less advanced than modern novels. They’re simply different. And when we read them, we read something that’s very different and yet equally good. I think the thing that I love most about Gissing is the way that he shows me what realism is. It’s possible, in his books, to feel exactly the moment at which they go off the rails and deviate from what would happen in a Dickens novel or a Trollope novel. For instance, I’m currently at a part where Monica (now marired) is conducting a somewhat-illicit dalliance with another man. In a Trollope novel, he’d turn out to be a cad. In a Dickens novel, she would be a trollope AND he would be a cad. But in a Gissing novel, you’re not sure. Neither are cads. They’re both just people–good people who are caught up in their emotions and in the whirl of events. And because of that, you really have no idea what will happen.